Protein is one of the most important nutrients that your aging parent can eat. This nutrient is vital for tissue growth and repair, wound healing, and energy production. If you are like many family caregivers who are encouraging their elderly parent to seek improved health and wellbeing by trimming down the amount of meat and animal products that they eat in their daily lives, you might be concerned that they are not going to get the amount of protein that they need. This is especially true if your parent is like many older adults and has a reduced appetite that makes it more difficult for them to eat as much as they might need. Snacking can be an important part of encouraging them to not only eat enough, but to get enough protein in their regular diet. Ants on a log. 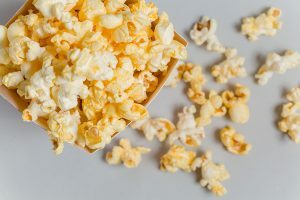 It might be an old childhood favorite, but the nutritional strength of this simple snack still stands strong even as your aging parent gets older. Spread natural peanut butter on pieces of celery and top them with raisins for a snack that combines protein, fiber, and carbohydrates. Change up the experience and make it a bit more sophisticated by trying different types of nut butters and dried fruits, such as almond butter, cashew butter, of sunflower seed butter, and dried cranberries, dried blueberries, or dried cherries. You can also change up the classic with a completely savory version with cream cheese, or an animal-free version, spread on slices of bell pepper and topped with black olives. Popcorn. Popcorn is not just for movies. This filling snack is tasty and inexpensive, and it is also a fantastic vehicle for protein rich ingredients. Try mixing air popped popcorn with lightly fried garbanzo beans and curry powder for carbohydrates, fiber, and protein that you can bump up with as much of the air popped popcorn as they would like to keep them feeling fuller, longer. Trail mix. There is a reason that this is the go-to snack for hikers and other active people. Trail mix is a simple, delicious, and highly customizable, and packed with a tremendous amount of nutrition. This makes it perfect for bringing along with you so that your aging parent or you can simply toss a handful in your mouth when you are feeling a little hungry or need a boost of energy to get you through your day. Try the classic mix of peanuts, raisins, and dark chocolate drops for a simple mix, or get creative. Combine different nuts and dried fruits to make your parent’s favorite flavor and texture combinations. Try adding in seasonings to change the flavor or enhance the ingredients that you have chosen. As you are enjoying the fall weather, try making your protein-packed snack more seasonal by tossing your parent’s nuts in cinnamon, nutmeg, cloves, ginger, and a small sprinkle of brown sugar for a pumpkin pie spice experience. If you or an aging loved one are considering caregiver services in Matawan, NJ, please contact the caring staff at Lares Home Care 1-800-781-7435 or 732-566-1112.